Picture a room: spacious, with blank-white walls, it seems the height of impersonality. From this coldness loom dozens of furniture pieces, every crevice suffused by cement, figures of unapologetically brutal beauty. Some contain embedded hair, bone and even clothing. The absence of a body becomes starkly physical; concrete seeps into every inch of the furniture, turning what was once comfortable and homely into something heavy and foreign. This is the weight of loss. What used to be a wooden chair – a place for a body to sit and rest itself – is now piled with discomfort. There is no space for a body here now, not even for feet to kick beneath the chair’s legs. The memory of the body which once sat upon the chair is crushed by the weight of a new, all too real, presence. And it’s not just chairs. The room is full of cupboards, drawers, desks, and even beds, all at a respectable distance from each other. These untitled pieces are the work of Doris Salcedo (1958 -), a Colombian artist known for her haunting explorations of absence, disappearance and violent loss. The untitled furniture sculptures span nearly two decades, from the late 1980s into the 2000s, and serve to represent those abducted and executed by military forces. Salcedo manages to convey both the brutality of sudden disappearances, and the weight of losing a loved one. She uses only materials that would be accessible to people living in poverty in Colombia, materials that become unbearably heavy but won’t break under the pressure of liquid concrete. As Salcedo herself puts it, “What I’m addressing in the work is something that is actually in the process of vanishing … a half-present reality. You never manage to perceive it as something concrete; you never manage to grasp it” (Basualdo and Salcedo, 2000). In Salcedo’s native Colombia, a four-sided civil war has simmered since 1948. It has included right-wing paramilitaries, the leftist group Revolutionary Armed Forces of Colombia (FARC), and the government’s army. Drug cartels – Colombia is a major producer and exporter of cocaine, amongst other illegal substances – have provided hundreds of millions of dollars in funding for guerrilla armed groups. Though today the FARC and the government are liaising with the United Nations to end the war, over the decades some three million people have been displaced by the conflict. It is people like this – ghosts, unknowns, untitleds – that Doris Salcedo returns to again and again. It is impossible to remain at an emotional remove from these sculptures, yet their impracticality leaves the viewer hovering at a distance. We are lost, losing. War creates a totality and you are embedded in it. It’s like being engulfed in a reality. Political events are part of everyday life here, so art and politics came to me as a natural thing, something that has been very much present in my life from the start… I believe war is the main event of our time. War is what defines our lives. And it creates its own laws. 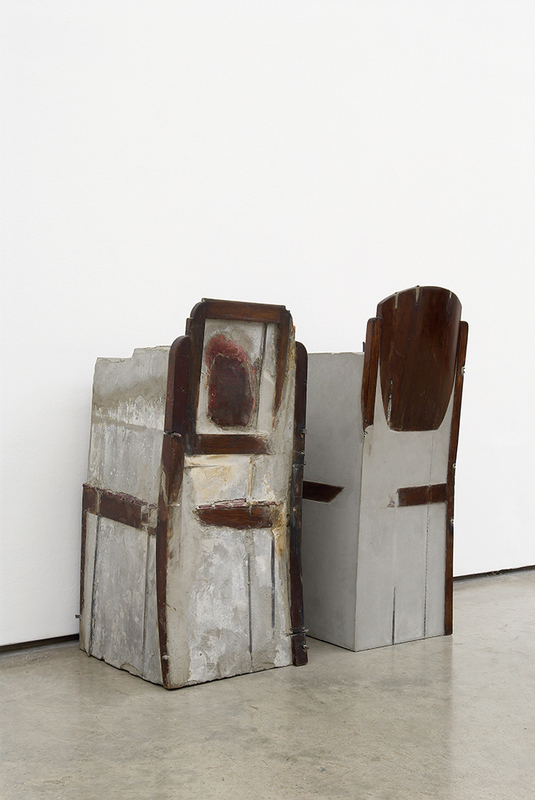 Salcedo’s concrete furniture seems to represents the embedding of the self and the self’s memory into the totality of war. Even the title – or lack of it – gestures towards this obliteration of identity. Each piece of furniture is a cenotaph, heavy with guilt, loss and implication. But these melancholy presences are not Salcedo’s only untitled work, nor her only work with furniture. Her 2003 untitled installation in Istanbul stacked approximately 1550 chairs, forming a mock high-rise, to consider the city’s history of migration and displacement. Alluding to the absent human body, the shirts reference the standard dress of workers on these plantations as well as funerary dress for the dead. Stacked in different quantities, these sculptures also appear to take measure of the loss of human life. Unlike in A Flor de Piel (2014) where an effluvium of dark crimson rose petals has been sutured into a shroud, the untitled work is bloodless. 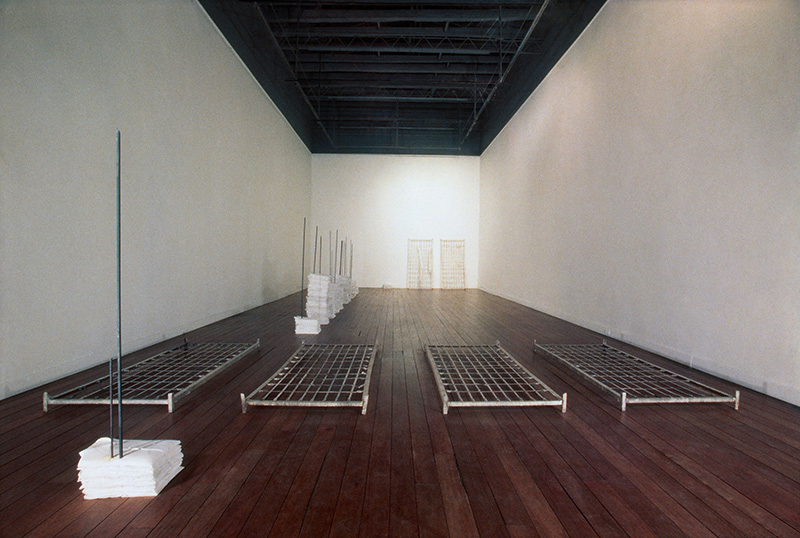 Salcedo’s furniture pieces stand, taciturn and unapproachable, belying the artist’s deep sense of sympathy for los desaparecidos (the disappeared). Leaving so many of her works untitled reclaims the unnamed, perhaps unnameable violence of loss from the detachment of politics and the anger of war. These sculptures hover between absence and presence; between the heaviness and the emptiness of loss. A chair is no longer just a chair, but a space where a body has been, and where, poignantly, it will never be again. These untitled works become ghosts, disconnected from language and identity: ghosts to haunt not only war-torn Colombia, but the world. Vera Mackie, ‘Doris Salcedo’s Melancholy Objects’, PORTAL Journal of Interdisciplinary International Studies 5.1 (2008). Nancy Princethal, Carlos Basualo, and Andreas Huyssen, Doris Salcedo (London: Phaidon, 2000).